Antiabortion conservatives have long sought to eliminate private insurance coverage of abortion, and their main tactic in Congress has been to push for barring health plans from covering abortion if any part of the plan is paid for with federal dollars. Abortion coverage is already severely restricted and difficult to obtain in many parts of the United States, and further federal restrictions will make things worse for patients who need abortion care. The obsession with banning abortion coverage threatens broader efforts to expand and improve U.S. health insurance coverage and to make it more affordable. At the federal level, antiabortion policymakers have used federal funding as a pretext for proposed restrictions. First, they argue that antiabortion taxpayers should not have to violate their religious or moral convictions by helping to fund insurance plans that cover abortion. Second, they insist that no compromise policy can satisfy taxpayers’ concerns. For example, they claim that the ACA’s current policy—under which federal dollars cannot pay for abortion coverage, but segregated funds from enrollees’ premium payments can—indirectly allows federal dollars to fund abortion by “freeing up” other resources. Conservatives’ dogged commitment to their goal of eliminating private insurance coverage of abortion is a clear threat to the ability of millions of people to access and afford abortion care. Moreover, antiabortion conservatives have turned their demand into a roadblock to efforts that might lower overall premiums and deductibles, improve consumers’ choice of health plans, or otherwise improve on the ACA and expand health insurance coverage in the United States. Antiabortion conservatives see their past success in restricting abortion coverage under Medicaid and other federal programs as a template for imposing restrictions on private insurance coverage as well. The ACA provided them with an opening, because it established substantial new federal subsidies for many private insurance plans, which plans and consumers cannot afford to turn down. 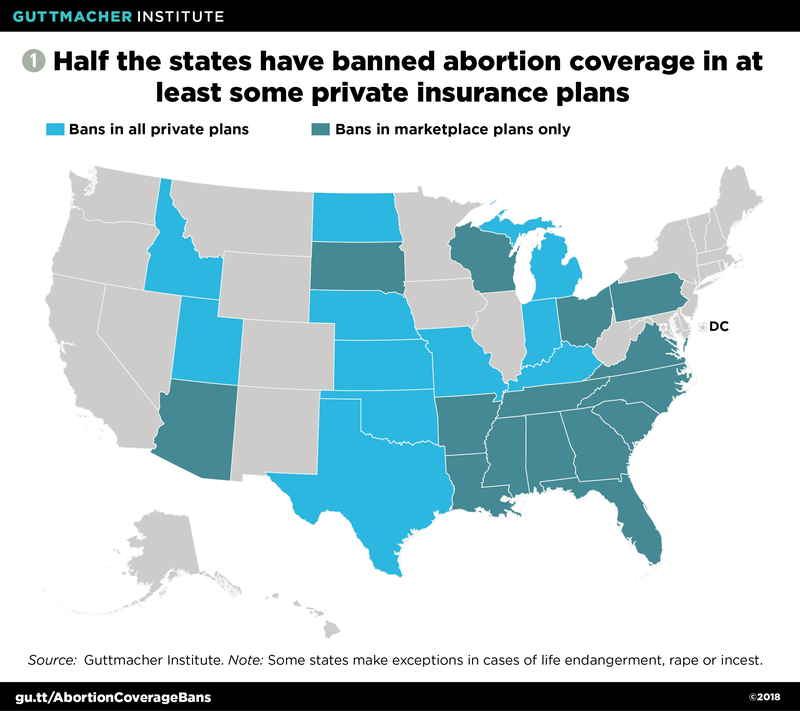 Individual states would not be in a position to preserve abortion coverage if a federal restriction on private insurance plans were enacted, because there would not be any state program or money involved. Rather, a state would need to set up a new program purely for abortion coverage for otherwise privately insured people—an extreme step away from the status quo, where many states are neutral on the question of abortion coverage in private insurance. That use of federal money is not really the issue is made clear by the antiabortion movement’s rejection of the ACA’s current policy, which allows insurance plans to cover abortion but requires them to wall off federal dollars from private dollars to ensure that no federal money pays for abortion coverage or services. Only a small number of antiabortion lawmakers agreed to that policy as a compromise to get the ACA enacted. Those members of Congress were swiftly rejected by the broader antiabortion movement, which falsely argued at that time and ever since that the ACA was a massive federal subsidy for abortion. Antiabortion conservatives have fought relentlessly for a different policy: to bar any health insurance plan that receives even a dime of federal money from covering abortion. They pushed for this restriction throughout the debate over ACA enactment, in subsequent stand-alone legislation, during the effort to “repeal and replace” the ACA in 2017, and in debating new federal investment to lower insurance premiums and expand consumer options. The specific language proposed has varied, and most recently, congressional conservatives have argued that they “merely” want to apply the Hyde Amendment language to private insurance plans. However, the bottom line is that the antiabortion movement would not propose or accept any language that would fail to accomplish the goal it has consistently pursued. Antiabortion policymakers are seeking to make this situation worse with new restrictions. For example, if they succeed in barring the use of federal funds (such as federal subsidies to help enrollees afford premiums and cost sharing) for ACA marketplace plans that cover abortion, that would effectively eliminate abortion coverage in marketplace plans altogether because those federal subsidies are too important for consumers to pass up. If Congress were to place that type of ban on federal funds that go to all individual market plans and to employer-based plans (such as many “reinsurance” proposals, which would protect insurance plans against unexpected costs and thereby lower premiums), it would effectively eliminate abortion coverage more broadly. Antiabortion policymakers plan to keep adding restrictions to as many parts of the health insurance market as possible, until there are no insurance plans left that can cover abortion or are willing to do so. New federal restrictions on plans that cover abortion would be particularly harmful in the four states—California, New York, Oregon and Washington—that have worked to protect abortion rights and access by requiring private insurance plans they regulate to cover abortion.5 A federal restriction would place these states in an untenable position: The state might be forced to reverse or stop enforcing its abortion coverage requirement, or else state residents and health plans might find themselves unable to receive federal subsidies—a situation that would negate Congress’s attempts to make private insurance coverage more affordable. For the six in 10 privately insured abortion patients who pay out of pocket, it is unclear what specific hurdles they face. Some patients may have health insurance plans that do not cover abortion, or they may not know whether their plan covers the procedure. Others have high deductibles that must be met before their plan covers any expenses. In some cases, a patient’s health plan may not include her abortion provider in its network. And given the stigma that surrounds abortion, some patients may opt not to use their insurance coverage because they worry that their insurer, employer, spouse or parent might find out about the abortion. Abortion coverage restrictions contribute directly or indirectly to most of these barriers. The idea of separately sold abortion “riders” is unfeasible and deceptive. In many of their proposals to restrict private insurance coverage of abortion, antiabortion policymakers and advocates have put forward the idea—sometimes through specific legislative language and sometimes only implied—that enrollees would still be able to use their own money to purchase separate insurance policies (“riders”) that only cover abortion. They claim this option would mitigate any harm to enrollees’ rights and health. That idea is unworkable and unreasonable, both in theory and in practice. In essence, it would require that people prepay for an abortion. Yet abortion is a health care service that few people anticipate needing; for example, people do not anticipate an unwanted pregnancy or a severe pregnancy complication. In addition, a requirement that abortion coverage can be offered solely through a rider sends a signal—an intentional one—that abortion is not “real” health care. Conservatives’ arguments about taxpayer rights and indirect subsidies are unworkable and hypocritical. Antiabortion conservatives are also dishonest in making their core arguments for coverage restrictions. An abortion coverage restriction is not some sort of religious exemption for antiabortion taxpayers. Rather, it gives those taxpayers a veto power over insurance coverage that other people can receive. And if the idea of a taxpayer’s veto took root, it would make governing impossible. Antiwar taxpayers would be able to veto funding for the U.S. military. Corporate taxpayers would be able to veto policies that give advantages to their competitors. Anti-tax activists would be able to veto taxes entirely. Similarly, the argument that spending government money “frees up” private dollars to be used elsewhere (a concept referred to as “fungibility”) is one that only ever seems to be applied to reproductive health care.17 The U.S. government has a long tradition of involving private-sector organizations in achieving its goals in areas like public health, social welfare and global development, and fungibility is rarely, if ever, raised as a problem. For example, many billions of federal and state dollars go to religious organizations and charities every year, and by the logic of fungibility, all of that money would free up private funding to proselytize or engage in other religious activities. If that were true, then any government funding to a religious organization would be a violation of the U.S. Constitution’s Establishment Clause, since it would indirectly subsidize religion. Antiabortion politics threaten progress on expanding and improving health insurance coverage overall. Despite occasional protests to the contrary, few conservative policymakers have demonstrated serious interest in expanding health insurance coverage or taking steps to make it more affordable for everyone. It is obvious that many policymakers only care now because they fear the political consequences of rising premiums and fewer coverage options under their watch. In that context, it should be equally obvious that conservative policymakers’ attempts to impose new abortion coverage restrictions in any proposal to make broader insurance coverage more affordable is an example of bad-faith negotiation. An abortion coverage restriction is a “poison pill,” designed to shift the blame to others for conservatives’ failure to compromise and to act constructively. And if conservative policymakers ever waver, antiabortion advocates will force them to toe the ideological line, because advocates see the ongoing fight over health insurance affordability as an opportunity to advance their long-term goal of eliminating abortion coverage. The consequences of this standoff for the United States are severe: It means that abortion politics will perpetually interfere with any proposal in Congress to expand health insurance options, reduce insurance premiums and deductibles, or do anything else that involves spending federal dollars to make private insurance coverage work better. Similarly, antiabortion conservatives will make abortion coverage a front-line obstacle to more ambitious proposals, such as a “public option” for people in any income bracket to buy into Medicare or Medicaid, or a plan to set up single-payer insurance coverage. Policymakers and advocates working to make health coverage better for more people in the United States cannot allow antiabortion forces—who will never accept compromise—to get in the way of progress. At the same time, policymakers and advocates must continue to press for repeal of the Hyde Amendment and other abortion coverage restrictions, and work toward requiring that all public and private insurance plans cover abortion—like any other vital health care service—so that it is affordable and accessible for everyone who needs it. 1. Guttmacher Institute, Restricting insurance coverage of abortion, State Laws and Policies (as of May 2018), 2018, https://www.guttmacher.org/state-policy/explore/restricting-insurance-coverage-abortion. 2. Guttmacher Institute, State funding of abortion under Medicaid, State Laws and Polices (as of May 2018), 2018, https://www.guttmacher.org/state-policy/explore/state-funding-abortion-under-medicaid. 3. Hasstedt K, Abortion coverage under the Affordable Care Act: advancing transparency, ensuring choice and facilitating access, Guttmacher Policy Review, 2015, 18(1):14–20, https://www.guttmacher.org/gpr/2015/04/abortion-coverage-under-affordable-care-act-advancing-transparency-ensuring-choice-and. 4. Salganicoff A et al., Coverage for Abortion Services in Medicaid, Marketplace Plans and Private Plans, Menlo Park, CA: Kaiser Family Foundation (KFF), 2016, https://www.kff.org/womens-health-policy/issue-brief/coverage-for-abortion-services-in-medicaid-marketplace-plans-and-private-plans/. 5. Sobel L, Rosenzweig C and Salganicoff A, Abortion Coverage in the Bipartisan Health Care Stabilization Act of 2018 (S. 1771), KFF Issue Brief, Menlo Park, CA: KFF, 2018, https://www.kff.org/womens-health-policy/issue-brief/abortion-coverage-in-the-bipartisan-health-care-stabilization-act-of-2018-s-1771/. 6. 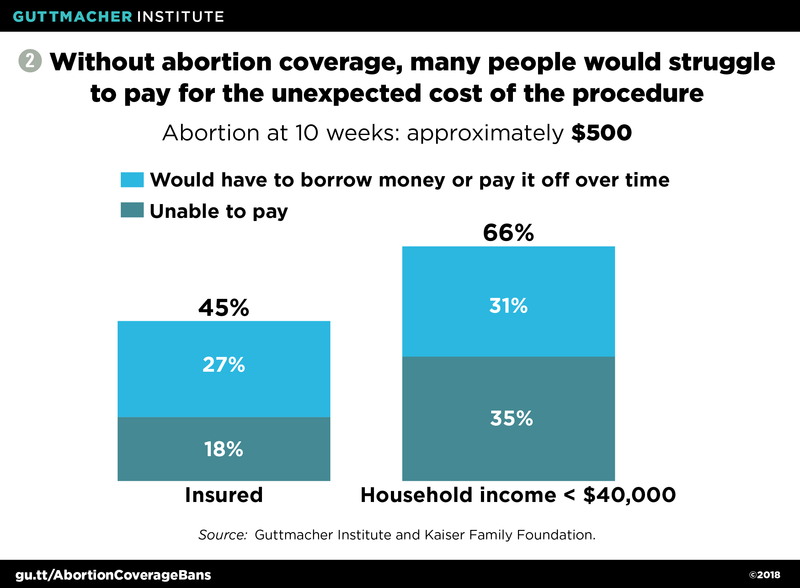 Boonstra H, Abortion in the lives of women struggling financially: why insurance coverage matters, Guttmacher Policy Review, 2016, 19:46–52, https://www.guttmacher.org/gpr/2016/07/abortion-lives-women-struggling-financially-why-insurance-coverage-matters. 7. Jerman J, Jones RK and Onda T, Characteristics of U.S. Abortion Patients in 2014 and Changes Since 2008, New York: Guttmacher Institute, 2016, https://www.guttmacher.org/report/characteristics-us-abortion-patients-2014. 8. Jerman J and Jones RK, Secondary measures of access to abortion services in the United States, 2011 and 2012: gestational age limits, cost, and harassment, Women’s Health Issues, 2014, 24(4):419–424, https://www.guttmacher.org/article/2014/07/secondary-measures-access-abortion-services-united-states-2011-and-2012-gestational. 9. DiJulio B et al., Data note: Americans’ challenges with health care costs, KFF, 2017, https://www.kff.org/health-costs/poll-finding/data-note-americans-challenges-with-health-care-costs/. 10. Jones RK, Upadhyay UD and Weitz TA, At what cost? Payment for abortion care by U.S. women, Women’s Health Issues, 2013, 23(3):e173–178, https://www.guttmacher.org/article/2013/05/what-cost-payment-abortion-care-us-women. 11. Donovan MK, D&E abortion bans: the implications of banning the most common second-trimester procedure, Guttmacher Policy Review, 2017, 20:35–38, https://www.guttmacher.org/gpr/2017/02/de-abortion-bans-implications-banning-most-common-second-trimester-procedure. 12. Finer LB et al, Reasons U.S. women have abortions: quantitative and qualitative perspectives, Perspectives on Sexual and Reproductive Health, 2005, 37(3): 110–118, https://www.guttmacher.org/journals/psrh/2005/reasons-us-women-have-abortions-quantitative-and-qualitative-perspectives. 13. Foster DG et al., Socioeconomic outcomes of women who receive and women who are denied unwanted abortions in the United States, American Journal of Public Health, 2018, 108(3):407–413, https://www.ncbi.nlm.nih.gov/pmc/articles/PMC5803812/. 14. National Women’s Law Center, Nowhere to Turn: How the Individual Health Insurance Market Fails Women, 2008, https://nwlc.org/resources/%20nowhere-turn-how-individual-health-insurance-market-fails-women/. 15. Sonfield A, No one benefits if women lose coverage for maternity care, Guttmacher Policy Review, 2017, 20:78–81, https://www.guttmacher.org/gpr/2017/06/no-one-benefits-if-women-lose-coverage-maternity-care. 16. Rosenzweig C, Sobel L and Salganicoff A, Abortion Riders: Women Living in States with Insurance Restrictions Lack Abortion Coverage Options, KFF Data Note, Menlo Park, CA: KFF, 2018, https://www.kff.org/womens-health-policy/issue-brief/abortion-riders-women-living-in-states-with-insurance-restrictions-lack-abortion-coverage-options/. 17. Dreweke J, “Fungibility”: the argument at the center of a 40-year campaign to undermine reproductive health and rights, Guttmacher Policy Review, 19:53–60, https://www.guttmacher.org/gpr/2016/10/fungibility-argument-center-40-year-campaign-undermine-reproductive-health-and-rights.